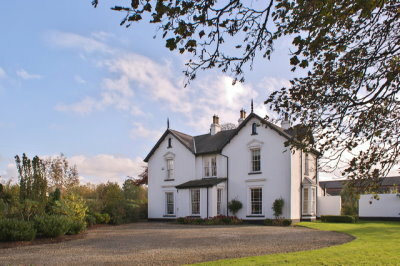 Built around 1855, Grade B1-listed Marlagh Lodge, on the outskirts of Ballymena, Co Antrim, was restored by Robert and Rachel Thompson who bought the property in 2003. 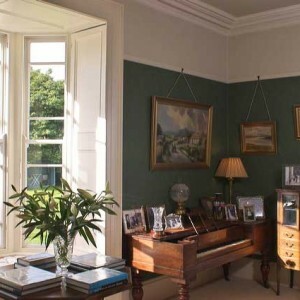 Marlagh Lodge provides elegant country house accommodation in three beautifully decorated en suite rooms, and is a fine location for private dinner parties. 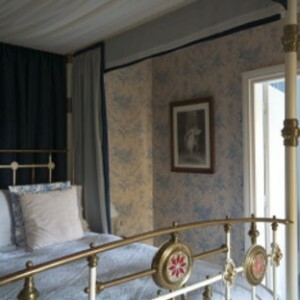 The Blue Room with its king-sized Victorian cast iron four-poster is especially popular. The en suite bathroom has a roll-top bath (lovingly restored by Rachel!) and an interesting mahogany-framed blue sink dating from the 1920s. 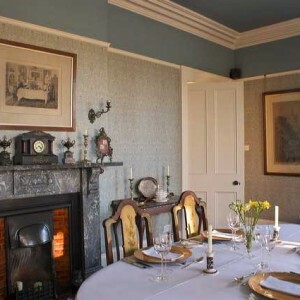 The Chintz Room has a cast iron double bed and en suite bathroom, again with a restored roll top bath. The Print Room has ornately carved mahogany twin beds. Its private bathroom is just across the hall. Breakfast at Marlagh Lodge will certainly set you up for the day! There’s fresh fruit, fresh bread, cereals and muesli to start off with, then goodies such as ‘Marlagh Lodge Tummy Warmer’ – creamy porridge with Bushmills whiskey, brown sugar and cream. Of course, we only use the best ingredients in our Ulster Fry – local sausages and bacon, traditional soda bread and potato bread and local free range eggs. You may prefer something a little lighter – an omelette, perhaps, or Rachel’s fantastic scrambled eggs with our fishmonger’s own wonderful smoked salmon. Take the A26 towards Ballymena. After about 5 miles, pass ‘Line Bridge’ at Woodgreen. After pair of school patrol signs, take next turn on right, signposted ‘Country Garage’ (Ballycowan Road). Go straight over two crossroads to Rankinstown Road. Marlagh Lodge is the last entrance on the right (pink gravel driveway).